Do Seating Arrangements and Assignments = Classroom Management? Now might be a good time to take a long look at your classroom seating arrangement. Advice and opinions about classroom arrangements and seating assignments abound -- and Education World explores the possibilities. Included: Tips from Fred Jones on how to get the most out of classroom arrangements. Arranging a classroom seems simple enough. Assign students to seats in nice neat rows that fill up a classroom. Right? Not so fast. Classroom management experts and experienced educators say the decisions teachers make about whether students will be allowed to select their own seats and about the physical arrangement of the classroom can have an impact on classroom discipline and the effectiveness of instruction. 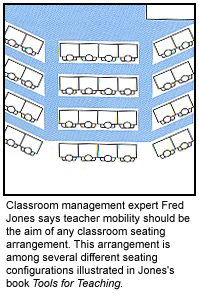 Classroom management expert Fred Jones, author of Tools for Teaching, says the typical classroom arrangement, with students' desks lined up in neat rows, makes it easy for custodians to do their jobs but tough for teachers to freely walk among their students' desks. Teachers should be able to get around the classroom quickly and frequently, says Jones. "Don't approach this as a Jones's philosophy," Jones told Education World. "In fact, talk to any experienced teachers, and they think of this as a commonsense approach. Either you work the crowd or the crowd works you. "As the teacher is moving about the room, he or she can check the students' work. 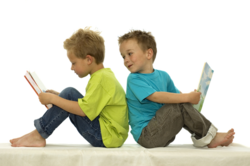 There is a lot less fooling around a lot more time on task just by being among the kids and moving around the room. Natural teachers are doing it because it's obvious. "As the teacher strolls around the room, what they keep doing is having the kids subconsciously saying, 'I have to keep working,'" Jones said. The bottom line is that a good classroom seating arrangement is the cheapest form of classroom management. "It's discipline for free," he said. Considering that many classrooms are overcrowded, teachers need to think about how they can arrange students' desks so broad walkways run from the front to the back of the class and also from side to side. "The best room arrangement is a room with wide walkways," Jones said. However, one "correct" room arrangement doesn't really exist. A room arrangement will depend on the dimensions of the classroom. One example of an effective room arrangement is one that groups students into three sections, as depicted in the photograph. Jones suggests pushing two desks together on each side of the room, angled at a slant toward the front of the room and push four desks together in the middle of the room. That arrangement creates two walkways to the back of the room and four walkways side to side between the rows. "I agree that the physical arrangement to seating and the assignment (or lack thereof) to such is basic classroom management," said Marlynn Elliot Fulton, a visiting instructor and Teacher in Residence at the Neag School of Education, University of Connecticut. "There is a very delicate balance between the teacher communicating a sense of territory (teacher in charge) and the students feeling comfortable and at home," Fulton told Education World. "Each of us has to find the balance that best suits us and the class we are teaching. Just think of the differences between the cozy reading corner with rocker and rug found in most kindergarten classrooms and the rigidly organized rows one sees in certain high school classrooms. Each has its place and purpose." A high school history and social studies teacher for 27 years, Fulton preferred -- and still prefers in a college setting -- arranging students' desks in a semicircle, one desk deep. "Each student can see every other student (as can I) and each person's ideas are given value in discussions," she said. Fulton states that there are advantages and disadvantages with about every type of seating arrangement. Teachers need to find one that works for them. Many teachers recommend assigned seating to let students know who is the boss. "Unless the teacher takes responsibility for assigning students to seats that will facilitate discipline and instruction, students will always do just the opposite," Jones explains in his book. "When students as a group are given the freedom to sit wherever they want in a classroom, they will always choose the location for themselves that is to the teacher's greatest possible disadvantage." Not everyone agrees with that notion. Phil Clinton, principal of the Anglo-American School of Moscow in Russia sees it differently. During a listserv debate last year about whether teachers should assign or not assign students to specific seats, Clinton objected to assigning students seats. "All this talk about control in the classroom is very interesting but more than a bit disconcerting," he stated. "Is it really a question of controlling our students? Not that I'm for education in chaos, mind you, but is control really the aim here? What about the belief that those students are actually people and that none of us likes to be controlled? There is research and experience to show that students who have a voice in establishing the rules are much more likely to internalize and truly support/follow those rules." Clinton said that although he wrote those comments a year ago, he still holds that same belief. "I live and work in a country where control was, indeed, the major issue. Now that the regime that had all that control is in disarray, no one knows quite how to act. There's something about control that goes counter to education in a democratic society."